I had a great time at the Abandon Reason launch last week. How could I not? Playing in an abandoned parking garage, in the dark, with sea water seeping throughout, the sounds of other artists reverberating their way through the concrete space... what a fantastic mood! Read on for video footage. On arrival in Galway I set up a camera. 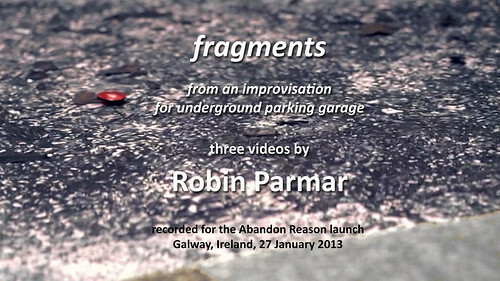 From the footage I assembled three fragments of my own playing that can only hint at the range of sounds and experiences on the day. Musicians included Gavin Prior (guitar), Aaron Coyne (keyboard), Kaiser Caimo (violin), David Colohan (various horns), Brigid Power Ryce (vocals), organiser Declan Kelly (harmonium, vocals, etc. ), and others. Most notable was New Yorker Catherine Sikora, who blew hot saxophone riffs that very much influenced my playing, though we didn't meet in person for another week. Fast-forward to last Saturday at The Guesthouse in Cork. Katherine played a solo set and then improvised with The Quiet Club. I was called up to read a random passage from the newly-installed library, and so found myself in collaboration again, from a different angle. I love these surprises! I've uploaded the videos in full quality to Vimeo, so you can check them out. The focus here is on my own playing, but you can hear other sounds leaking in. In the third video there is even footage of me playing, courtesy Susannah Kelly. She also took some fantastic still shots of the architecture, which I hope will see the light of day before long. For more info check out the Abandon Reason website. You will find photos, sounds, and some animated GIFs, including one of myself. Don't forget to buy the debut release, a collection that comes with a free art print. As for my music, I was playing the infinite viola, using some new patches I've devised. One uses a drum machine slowed down to 2 BPM. Another attempts to reverse the viola in real time, something that is strictly impossible but nonetheless fun to attempt! An important part of this technique is Colin Brown's Reverse Phreakology, an ensemble available to all Reaktor users. Besides this, I've built the patch to generate overtones to what I am playing, delay and recirculate riffs, and play back previous samples. My interest is in getting a robust support platform that nonetheless permits open improvisation. This is a side project that relates to The Drones. You can listen to that album for free through BandCamp. But if you are a string fan, I encourage you to buy the limited edition compact disk for the bonus tracks.